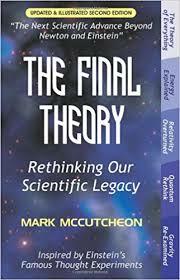 The Final Theory is a work of complete crackpot physics by one Mark McCutcheon, promoting an expansion theory according to which the reason gravity is so indistinguishable from an acceleration is because it is acceleration, caused by matter expanding at an ever accelerating rate (the theory thus obviates the need for a gravitational force). The idiocy, and brilliant display of lack of even the most rudimentary physics, is laughed at here, though several commenters seem unsure whether or not it is meant as a crazy joke. We are not going to try to unravel the nonsense here, but some main points are discussed here. Of course, scientists haven’t endorsed McCutcheon’s mad rantings. The explanation for that is that scientists are stupid and don’t know anything and will therefore go to great lengths to defend dogma. Apparently, among the things scientists don’t know is why putting things on tables doesn't break them. McCutcheon’s premise for concluding that scientists don’t know, is that he doesn’t. What’s interesting, though, is the promotional material. The back cover of the book, for instance, features quotes from scientists like Steven Weinberg listed so as to make it look like the scientists were endorsing the book, when in fact the quotes are not referring to the book at all. On amazon, the book has mostly five-star reviews by mostly new users without significant review histories using curiously similar phrasings and writing styles, since negative reviews tend to be mysteriously deleted – though even McCutcheon cannot prevent the “people who liked this also liked” section from showing books by David Icke. Wikipedia, too, seems to have had some trouble with McCutcheon fans. Diagnosis: Probably harmless, but that he has fans is a damning testament to the curious habit of conspiracy theorist (who “think for themselves” and have no time for expertise and background knowledge) to accept any ridiculous nonsense about topics they don’t understand, and then defend the position as aggressively as possible and by any possible means. Gee, 26000 people have looked up your profile but it's blank. Why are you hiding? Is the little boy afraid to show his little face? Exactly. We've seen how the loon supporters (who many times are nuttier than the loons) are willing to send death threats and even commit actual violence based on what their gurus tell them. I note that Kevin's profile is also blank. Butthurt loon troll must be SO butthurt.